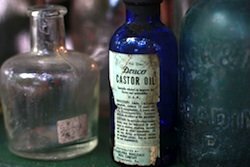 Is your diet solution pretty in the bottle, but harder to swallow than castor oil? A healthy diet plan defined on this page. A healthy diet plan is what you eat, enjoy and use to maintain ideal body weight for life. A diet is what you do before you regain the weight you lost. I hate diets. I've seen the carnage chronic dieting leaves in its wake. I have spoken to thousands of overweight people in my career. I have not spoken to one who enjoyed dieting. The overwhelming majority hated dieting because they realized how harmful it was to them. A lady from Gallup, New Mexico said it best, "If it wasn't for dieting, I wouldn't have a weight problem." She admitted to going on a 1000 calorie a day diet to lose post pregnancy weight. She lost her weight and regained weight several times. Each diet brought additional weight with the regain. This is not the exception, but the rule. When we say, "diets don't work" what we are really saying is no one can suffer the misery long enough to lose weight. Of those that do reach ideal body weight, the majority begin regaining weight within 30 days of reaching their goal. Thirty days! Why is it only the overweight or obese diet? Is it because they need to? Not entirely. They need to diet because they have dieted before. More than likely, regained more weight than initially lost. I believe chronic dieting is second only to a sedentary lifestyle as the biggest cause of obesity. 66% of the entire American population is overweight. As a naturally thin person, I'm a minority. Obesity in adults has doubled in the last 20 years while the number of obese children has tripled. The average American adult will consume 100 or more calories a day than they will burn. The equivalent of an average 10.4 pound weight gain per year. Americans spend $46 billion per year to lose weight. Billions more is spent on research and care. All of this and the only solution society offers is more pain, confusion and perfectly balanced nutritional lifesavers that are pretty in the bottle, but harder to swallow than castor oil. I asked my clients and students to design a Wish List diet. The result was a comprehensive outline of a healthier diet plan that dramatically reduced or eliminated the need for motivation by eliminating food cravings. I call it the Foolproof Weight Loss Solution. A step-by-step blueprint to a naturally thin life. Free from all weight loss issues. I know that's a big promise and you've heard it before! What you haven't heard is how different Foolproof Weight Loss is from dieting. People flat out told me that improving nutrition was "not a major concern." I was told that what they really wanted was a healthy diet plan they liked and enjoyed. A healthy diet plan that would maintain their ideal body weight. They want to LOSE WEIGHT, KEEP IT OFF AND DO IT WITH A MISERY INDEX OF ZERO! I can think of no sane person who enjoys pain and suffering. My clients and students universally agreed dieting was extreme pain and suffering. Worse, many said they felt they were being punished. I was told the stricter and more extreme the diet, the greater the shame, guilt and embarrassment suffered. The best weight loss plan is a healthy diet plan. How healthy can shame, guilt, embarrassment, cravings and hunger be? Why do weight loss professionals believe they must tell people the only way to effective weight loss is an all-or-nothing, perfect diet?! Traditional dieting is an abomination. It feeds the obesity epidemic a life at a time. We can do better than that. You don't need a diet make-over to lose enormous amounts of weight. Here's how easy it can be. Reduce 280 calories per day. The same amount of calories in one 2.7 ounce Snickers candy bar. You lose 29 pounds in one year. Take a brisk 30 minute walk five days per week and you lose an additional 15 pounds. You lose 44 pounds in one years time. Cutting 280 calories and taking a 30 minute walk five days per week. The alternative is to destabilize your metabolism with another calorie deprived diet. My successful weight loss clients became successful by duplicating the success of others. It was discussed in focus groups, private sessions, in surveys and questionnaires. My clients made it clear what a healthy diet plan had to offer to be successful. And using a form of dietary therapy to lose weight was NOT one of them. I'm not promoting a junk food diet. That's not the case at all. I do not think healthy eating includes dietary restrictions or a "can't have" list of foods. How healthy is it if you can't stay on it? I believe the best diet plan is one that combines fun foods plus healthy dishes from your own preferred food list. No one specific diet will work for everyone. Complying with the food police's idea of nutritional standards is not realistic. It has failed miserably. People gain weight after they diet. They diet again and gain even more weight. Soon you graduate from having a few pounds to lose, to being obese. Overweight people want to lose weight and keep it off. They know from past experience that calorie deprivation and a diet makeover never succeed. Yet that is what is usually recommended. People do not want to "diet" to lose weight. They don't want to feel hungry or crave favorites. Returning to ideal body weight should be as natural and non-intrusive as possible. Reduce the portions you're eating now. Increase physical activity. The combination reduces calorie intake while simultaneously increasing calories burned. Certain weight loss will result. And that's the best healthy weight loss tip. Reach ideal weight first with non-intrusive portion control. After reaching your goal improve nutrition with a real healthy diet plan. That's what people really want. Overweight people are much less interested in balanced nutrition than in reaching and maintaining their ideal body weight. Balanced nutrition is not necessary for weight loss.